A resort inn with spa, several historic Cape Cod inns, and a modern hotel: Sandwich has them all. Sandwich, the first town you encounter on Cape Cod after crossing the Sagamore Bridge over the Cape Cod Canal, is a fine place to stop for the night. 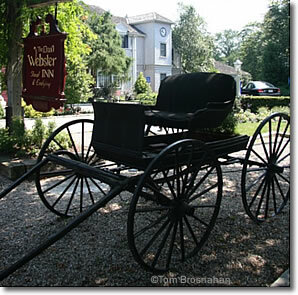 Perhaps the most prominent Sandwich hotel is the 4-star, 48-room Dan'l Webster Inn and Spa, with a full-service spa, five dining rooms, an outdoor swimming pool, and hot tub. Some rooms have fireplaces and spa tubs. The atmospheric 3-star, 23-room Belfry Inne & Bistro is within walking distance of the Sandwich Glass Museum and Thornton Burgess Museum. Its bistro serves lunch, dinner and Sunday brunch. The nearby 3-star, 7-room Isaiah Jones Homestead Bed and Breakfast is historic, cozy and convenient. The 3-star, 5-room 1750 Inn at Sandwich Center is even cozier, with flowered patio and garden for good weather, an indoor hot tub for when it rains. The 2-star, 75-room Sandwich Lodge & Resort, on MA Route 6A west of the town center, is modern and convenient with microwave oven and mini-fridge in the guest rooms, indoor and outdoor swimming pools, a barbecue grill, and budget rates.